Take your dog on a safe and fun adventure in the car or out on the trails with the Vented Vest Dog Harness in Raspberry by Canine Friendly! 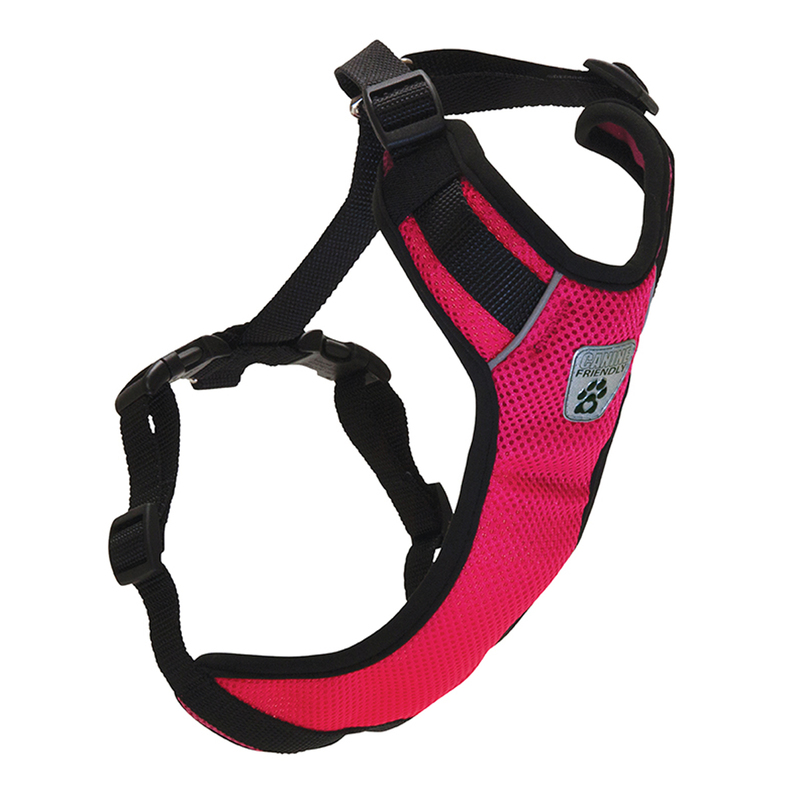 The Vented Vest Dog Harness V2 in Raspberry is designed with a breathable soft chest panel, this is a chest protector, non-choking harness and a car restraint, all in one. Easily connects to either a leash or a seat belt. Machine wash cold on delicate cycle. Do not wash with touch fastener items. Hang to dry. Do not iron, do not bleach, do not dry clean. If needed, pre-soak in an enzymatic cleaner like Nature's Miracle. This harness is very easy to put on and it works very well for our car rides. With the seat belt through the seat belt hole on the harness, I feel more comfort in knowing that my dog is safe while riding in the car. Great product for the price. Posted On 03/17/16 by Kathleen V from Roscoe, IL Yes, Kathleen V recommends this product! This harness is great for use in the car. The seatbelt goes very easily through the back loop. It even allows the dog enough room to lay down. This harness is really neat, and it is so simple and quick to put on and take off. Very bright colors to choose from!